A "false friend" is a word in one language that sounds similar to a word in another language but that means something different. For example, a common error Spanish speakers make is to use the English word "sensible" when they actually mean "sensitive". This is because "sensitive" translates to the Spanish word "sensible". If you are a Spanish speaker, you have probably been in similar situations before. Watch this lesson to learn about Spanish false friends and how to correct them to say what you really mean. Avoid embarrassing moments before they happen to you! 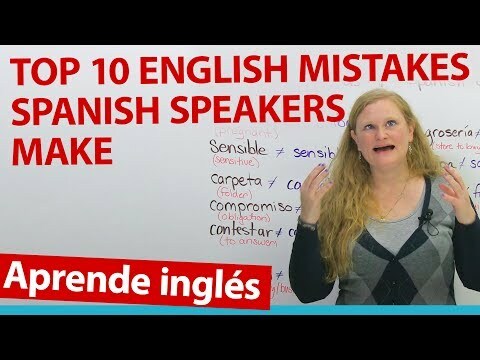 Don't forget to do the quiz at https://www.engvid.com/false-friends-english-spanish/ to practice what you've learned. TRANSCRIPT Would you like to be my friend? I don't want to be your friend actually. Maybe. My name's Ronnie. If you speak Spanish, you are very lucky because a lot of words in Spanish and English are very similar. You can change your accent, drop the "o" or the "a" at the end of it, make some hand gestures, and most of the time people will understand you, as long as they're not a little stupid, and this makes learning English for you easier. Yes! But life is not so easy, because we have some words that you think they mean something in English, but guess what? It doesn't translate. Probably the most popular example would be: "embarazada". So, in Spanish you know "embarazada" means pregnant, you're going to have a baby. In English it sounds like the word "embarrassed". So if you use the word, people are confused and you're probably embarrassed, too, because you've used the wrong word. So, in English we've actually made a term for these. These things are called "False Friends", and this is the Spanish Edition. Stay tuned for the Portuguese edition as well. "Embarazada" means pregnant in Spanish, but in English it sounds like our English word "embarrassed". "Embarrassed" means you've made a mistake, you've done something stupid, and people have seen you do it - and your face maybe goes a little red and you're a little ashamed of something. For example, if you're walking down the street and you fall, or you're picking your nose and somebody sees you pick your nose - you feel uncomfortable. You feel embarrassed. Okay. The next one, in Spanish you say: "sensible", "sensible", "sensible". In your language it means sensitive. By the way, guys, I'm not a Spanish speaker so I'm going to make mistakes with your language. I'm sorry. Bear with. So, in your language it means "sensitive". "Sensitive" in English means that you are aware of other people's emotions, or the other meaning is that you cry very easily or that you get angry very quickly. So if I say that you are sensitive... For example, if I say: "Oh, I don't like your shoes." If you are a sensitive person, you are upset. But in English, "sensible" kind of means the opposite. "Sensible" means that you're reasonable in your brain or you can make sense of something. So, for example, if I said to you: "I don't like your shoes." And you say: "Well, I don't care. They're not your shoes, Ronnie." So you're being reasonable or you're being sensible to my comment. Okay? False friends, they're a doozy. The next one we have is "carpeta". So, in Spanish "carpeta" is a folder, it's like a thick paper where you can put other documents in and keep it safe, keep it out of danger so you don't spill some Tequila on it. But in English it sounds like "carpet", so a carpet is something that covers your floor. We use carpets a lot because our floors are very cold in Canada. Most houses, I think... For example, in Mexico, you guys don't have a carpet, it's too hot. You have tile floor. But a carpet is a floor covering made of fabric, not a folder. Okay? The next one: "compromiso". "Compromiso" in your language means an obligation. "Obligation" means you have to do something or you must do something. For example, when you come to Canada through the airport you must show the airport security your passport. It's an obligation to do it. In English it sounds like the word "compromise". "Compromise" in English means you have reached an agreement. So, for example, you want to go and see a horror movie, your friend wants to go and see a romantic comedy movie. You disagree, have a little discussion about it, and then at the end you go: "Do you know what? As a compromise or as an agreement we'll go see a comedy movie because we both like comedy movies." So you've reached an agreement or you've reached a compromise. "Contestar" in your language means to answer, so you can answer a question. A teacher will ask you a question and you will contestar, you will answer the question. Hopefully correctly. Come on, get it right! But in English it sounds like the word "contest", and "contest" is like a competition. A "competition" or a "contest" means that there is one person and some other people, they are doing the same thing or similar thing. They're trying to win a prize. Смотрите видео False Friends: English mistakes that Spanish speakers make и вы сможете быстро выучить английский язык.